Gov. Phil Murphy (D) and New Jersey Department of Transportation Commissioner Diane Gutierrez-Scaccetti made a joint appearance on Jan. 22 to urge the Port Authority of New York and New Jersey to invest in a new monorail system for the Newark Liberty International Airport; an investment news reports indicated could cost more than $2 billion. 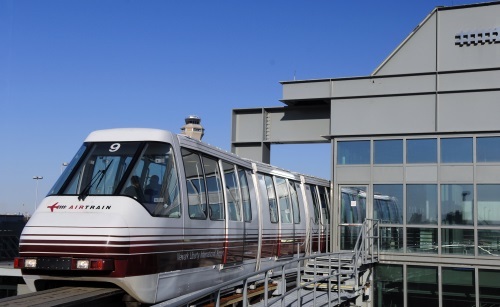 “The current AirTrain [monorail] was built over 20 years ago and the system simply cannot function as it should, all-too-often leaving passengers delayed and airport personnel unable to get to work on time,” said Gov. Murphy in a statement. Gov. Murphy noted that the current AirTrain transports about 33,000 riders per day between Newark Airport terminals, parking lots, and car rental facilities to public transportation and the Northeast Corridor Rail Link – carrying more than 11 million riders annually. However, he stressed that the system “is nearing the end of its useful life and is beyond capacity constraints” and is also “interfering” with plans for future locations of terminals, roadways, and airfield taxi lanes. Building a new AirTrain system would also more than double the price tag for construction currently ongoing at Newark Liberty International Airport, which is currently in the midst of a $2.7 billion effort to build a new Terminal One facility.